Ben Jealous is joining our staff! 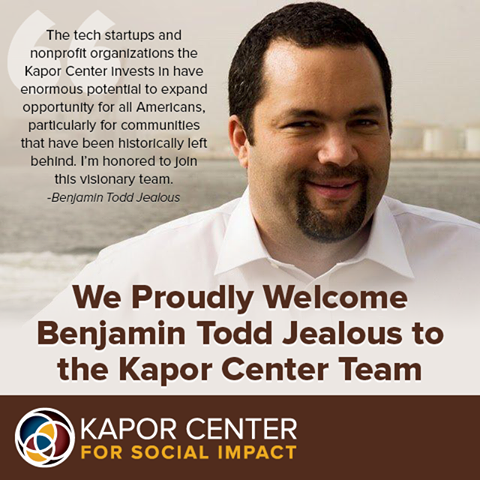 (Oakland, CA)- Benjamin Todd Jealous, who served as President and CEO of the National Association for the Advancement of Colored People (NAACP) until last December, will join the Kapor Center for Social Impact as a partner, the Center announced today. The mission of the Kapor Center for Social Impact is to provide educational access for all Americans, diversify the tech industry, and support startup companies that have a positive social impact. The Center works in two ways: Kapor Capital makes seed-stage investments in tech companies that close gaps in education, healthcare, economic inclusion and access to opportunity for Americans affected by growing inequality; and the Foundation invests in community organizations that focus on closing the same gaps. Jealous will also join the board of directors of the Kapor Center-funded Level Playing Field Institute, a non-profit organization dedicated to eliminating barriers faced by people of color in science, technology, engineering and math. The Kapor Center for Social Impact was one of ten foundations that joined the White House last week to pledge participation in the groundbreaking My Brother’s Keeper initiative to support young men of color in academic achievement. Kapor Center Co-Managing Partner Cedric Brown represented the Kapor Center at the White House. At the NAACP, Jealous was recognized as a leader of successful state and local movements to ban the death penalty, outlaw racial profiling, defend voting rights, secure marriage equality, and free multiple wrongfully incarcerated people from prison. Jealous said that his first order of business will be to initiate a learning tour of Silicon Valley to learn from the entrepreneurs and innovators who are shaping this sector.